Hoshigaki is like an artwork, and the making of hoshigaki is also like an art. 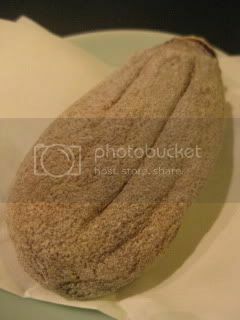 Hoshigaki means dried persimmon, and it's a traditional Japanese treat in the winter time. Making Hoshigaki is a long process which requires skilled techniques. Hoshigaki was originally brought to America by immigrants of Japanese farmers. 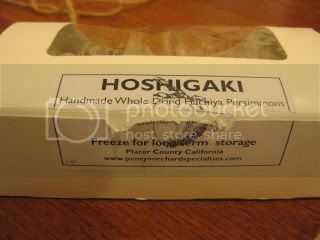 I've been enjoying American Hoshigaki, Penryn Orchard's special Hoshigaki so much this winter. I got a box of about 10 Hoshigaki as a gift from friend. 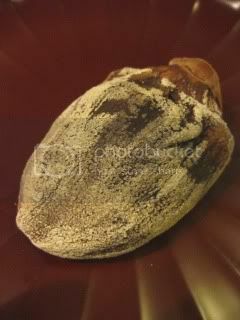 It has the nice complex flavor and dense chewy texture. Hoshigaki is typically enjoyed on its own, but recently, I learned from a friend of mine that Hoshigaki goes really well with butter. Hoshigaki and butter together?! So I tried. 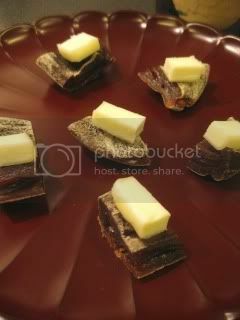 I sliced Hoshigaki into small pieces and topped each piece with a small cut of butter. My friend even suggested that I try this with Campari orange cocktail. So, I made it, too. I took my first Hoshigaki-butter combo into my mouth...and wow, he was right, they created something so special together! And, with a sip of Campari orange cocktail...he was right again! What a great pairing. This combo with Campari orange became my regular aperitif for the next days. Then, I thought of a different combo...how about Hoshigaki and cheese? 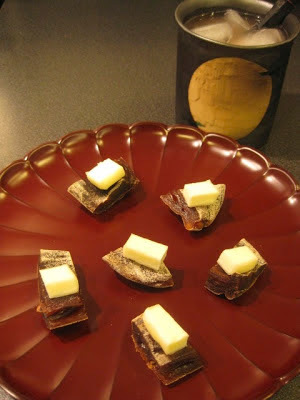 So, I made small Hoshigaki amuse with Comte cheese. Bravo!! In fact, I liked this combo even more than Hoshigaki-butter! And, yes, it was also great with Campari cocktail. 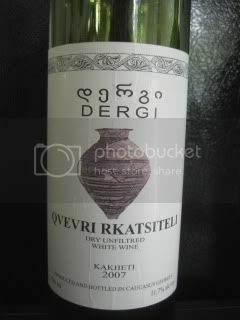 Then, I also tried with 2007 Dergi, Qvevri Rkatsiteli (Kakheti, Georgia), which is an unfiltered white wine, aged in qvevri (amphora), with the deep orange color. This rich wine complimented the rich Hoshigaki-Comte nibbles even more perfectly. Since I got so into American Hoshigaki, I wanted to try a different producer's and found Otow Orchard in Northern California. My order of Hoshigaki was just delivered Saturday. It was $43 including shipping. 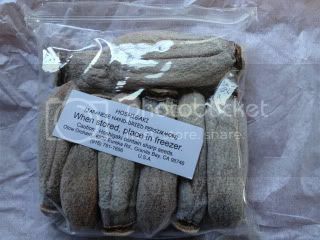 The package contained 8 large hoshigaki. As soon as I saw them, I could tell they were going to be something really special. 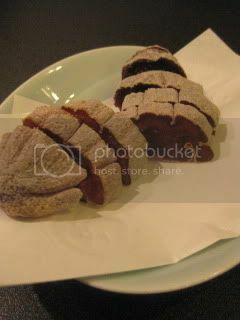 Otow Orchard's Hoshigaki was even better than my high expectation! 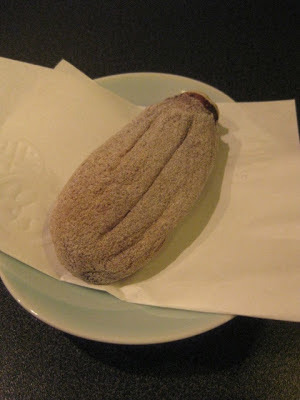 Super amazing Hoshigaki with the beautifully soft-chewy texture and really complex flavor. True art of nature. 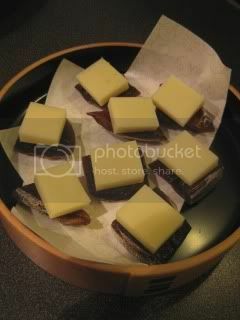 These were, of course, wonderful on their own, and also really nice with French Mimolette cheese. I better order more before their extremely limited stock will run out. I feel the Hoshigaki power.